According to TvLine, Hanna-Barbera’s The Banana Splits, will be reimagined as a meta horror film that will closely follow the thriller genre. The film will released through Warner Bros. Home Entertainment before premiering later on the Syfy network. The Kellog’s Cereal sponsored series was produced by Hanna-Barbera, and ran for 31 episodes on NBC Saturday mornings, from September 7, 1968, to September 5, 1970, with re-runs airing on Cartoon Network subsidiary, Bommerang. As the time, the costumes and sets were designed by Sid and Marty Krofft. 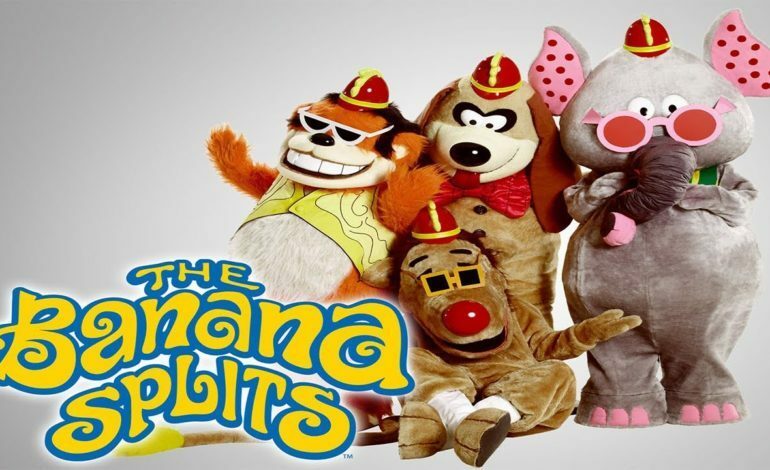 The Banana Splits Adventure Hour ran for an hour-long, while featuring an array of variety show sketches, one including the depiction of the fictional rock band composed of four funny animal characters, who also doubled as the costumed hosts of the show. Fleegle (gorilla) on guitar and vocals, Bingo (beagle) on drums and vocals, Drooper (elephant) on bass, and Snorky (lion) on keyboards and effects. It was also Hanna-Barbera’s first foray into mixing live action with animated segments. Per the official film’s synopsis, a boy named Harley will be celebrating his birthday by attending a taping of the Banana Splits TV show with his family. “But things take an unexpected turn — and the body count quickly rises.” Dani Kind (Wynonna Earp) will play Harley’s mother Beth, with Sara Canning (The Vampire Diaries) acting as the TV show’s producer Rebecca. The original costumed band will also make an appearance.